This nursery room is now empty. All of the puppies are now happy in their new homes with their forever families. Check back as we often have litters throughout the year. Or scroll down to get more information about our breeding program. 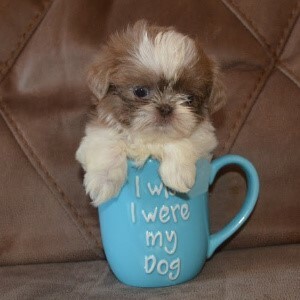 All available puppies from our Shih Tzu Nursery B come to you up to date on vaccinations and wormings. We no longer remove dew claws. Puppies are socialized from day one and started on potty training when ready. Most puppies are ready to go to their forever homes on or after 8 weeks of age. I prefer to keep them until 9 weeks. Those that stay with their mother one more week tend to do better in their new forever home. A non refundable deposit of $200.00 holds your puppy. I will accept PayPal, Check or Cash. The remainder is due when you pick up the puppy. Final payments should be either PayPal or Cash. Our free puppy package to you includes a bag of food, several toys and chews, and a sweet Mama scented blanket. We also offer a lifetime support for your puppy. All purebred pups are registered with the American Kennel Club (AKC) and limited registration is included in the price of the puppy. If you want breeding rights, the price is $1500 for girls and boys. If you need us to hold your puppy past the date that they are able to go home, you may incur a boarding charge of $5.00 per day. Currently the puppies are eating pawTree, Turkey and Brown Rice Formula. This is a grain-free food formulated by a person with a PhD in animal nutrition and is the highest quality of food that I have found yet. Please visit the pawTree site to learn more and place your order. We also give the puppies (and our adult dogs) NuVet Plus. You can read more about this supplement, here. Don't forget to sign up for our newsletter and like us on Facebook.